First, Naveda Walker was assaulted by a classmate at Beeber Middle School in West Philadelphia last year. Then, the teen was jumped leaving school while her mother helplessly listened on the other end of a phone conversation. Days later, a group of youngsters went to the Walkers' Overbrook rowhouse and announced they were there to fight Naveda. Fed up with the violence her daughter faced and the Philadelphia School District's inability to stop it, Wanda Walker said, she pulled her daughter from the district. 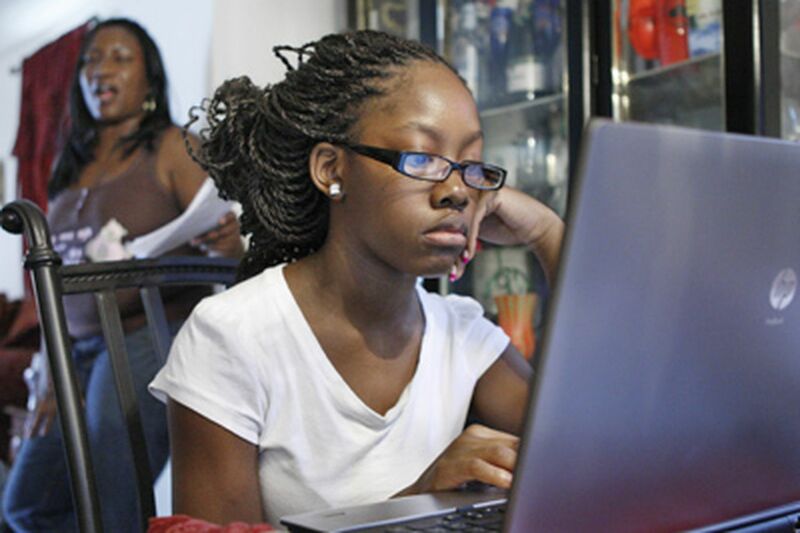 Now, Naveda is a ninth grader at Agora Cyber Charter, an online school. "I got frustrated with the district altogether. I was fearful for my daughter's safety," Walker said. "I'm not rich, so I couldn't just get up and move. I had to try something different for her." At first, the 14-year-old wasn't happy with the isolation of a school day away from her friends, alone at home with her laptop and books. But since she started an Agora program that allows her to take some classes in a classroom four days a week, she's much happier - so much so that her mother just reenrolled her for next year. "It's a better decision than going to a public school," said soft-spoken Naveda, whose pretty face recently helped her land modeling jobs. "It's more focused - the work and the students." And she said she felt safer. Naveda's choice is not uncommon, said virtual-school operators and national experts, although the evidence is largely anecdotal. "I have heard - especially with our Philadelphia students - that violence is an issue, a reason they come to us," said Sharon Williams, head of Agora Cyber Charter. "Safety is a reason why parents are keeping their kids at home." The largest group of students enrolled at Agora are from Philadelphia - 20 percent of the school's 6,420 students. Pockets of students are from other urban areas around the state - Pittsburgh, Reading, Lancaster, Allentown, Erie. Nationally, about 200,000 students attend online schools full time. They take computer courses led virtually by a teacher and study at their own pace. Many are enrolled in cyber charters, which receive public funding for each student. Pennsylvania has 12 cyber charters enrolling about 20,000 students. Experts say one factor fueling the growth of virtual learning is parents' desire to get their children out of dangerous schools, particularly in urban centers. "We do find that students choose online courses so they can have environments where they can focus on learning and not have the distractions that can take place when there's bullying or violence," said Susan Patrick, chief executive officer of the International Association for K-12 Online Learning. Naveda's trouble at Beeber started in December 2009, when as a newcomer she became the target of cruel chatter from other girls. The tension erupted one day in English class. Naveda told the group to stop harassing her, focusing her attention on a ringleader, Jykera Cooper. "I'll smack you, little girl," Naveda remembers Jykera saying. The girls fought. Naveda's glasses were knocked off her face. She tried to fight back. "Jykera was looking for anything to pounce on," said Lynn Larrick, the girls' teacher. "She went over, and she started hitting Naveda." Jykera admitted fighting, but said she had been provoked. Jykera and a friend were suspended. Naveda was sent home but not suspended. Rattled, Naveda's mother made her promise to call her every day when she arrived at school and when she left. One day, Walker got a panicked phone call from her daughter, who was on her way home. Another group of girls was after her, Naveda said. Walker told her not to fight. Ignore them, she said. Don't get on the bus. Go to your grandmother's house. She asked to speak to Naveda's friend Shawna. By the time Shawna took the phone, the girls had attacked, Walker said. "Miss Wanda, they just hit her," Shawna told her. "They knocked her down." The girls grabbed Naveda by the neck. They punched and kicked her face. Walker was terrified. Her daughter was being pummeled, and all she could do was press the phone tighter against her ear. Furious, Walker filed a police report. Trouble escalated. Naveda ended up in another brawl when 20 girls showed up at her house to fight. Eventually, the bad blood engulfed 30 neighbors in a melee. Naveda was anxious. Walker kept her daughter in the house most of the time. She was so worried that she arranged for Naveda to see a therapist. Walker finally removed Naveda from the district after another attack at the school, she said. District spokeswoman Shana Kemp said Beeber had handled the situation correctly. The girls in the first incident were suspended, and peer mediation was used, Kemp said. The district could not act on the attack on Naveda's way home from school because Walker had never taken the police report to Joseph Starinieri, the Beeber principal, as requested, Kemp said. Online education, Walker thought, would be a way to keep her daughter safe. "Here, on a computer, you can be whoever you want to be," Walker said. "They don't know who Naveda Walker is. No one is laughing at you." Walker said her daughter was thriving at Agora and particularly at the Learning Center, housed in a suite of rooms at an office building in East Falls. Inside Naveda's English class last week, about a dozen students sat at long tables with their laptops. Posters and charts decorated the walls. Teacher Kirshe Frye-Matte talked about persuasive writing to the students, who were in different grades. After a whole-class talk, the teens worked in small groups. Going to the Learning Center is optional. If she preferred, Naveda could conduct her learning only online, with different teachers for every subject and tests and papers, as in any other school. "I like it," Naveda said, "more than my old school." Jykera wasn't always a fighter, she said. As a sixth grader at Beeber, she didn't fight when taunted. But she found that strategy futile, she said - eventually, she felt she had to defend herself. "I always had to fight somebody, because that person don't like me. I felt I shouldn't have to do that. It's just a lot going on," Jykera said, pushing away tears. Her mother was shot in the head in 2000 and needs assistance. Jykera helps care for an autistic sister. Her older brother is always in trouble, she said. "I can't really teach her things," said her mother, Kim Forde. "I can't help her with a lot of things. But she's real good on the computer." Jykera has a beautiful voice. She finds refuge in singing, but even music can't erase her problems. Eventually, Jykera said, students from other schools began showing up at Beeber to fight her. She felt she had to brawl to prove herself. It "made them look at me like I was a bad child. Nobody never talked to me to understand why I was acting the way I was." After being suspended 10 times in seventh grade, she was sent to a disciplinary school, transcripts show. She missed 48 days of school that year, and returned to Beeber for eighth grade in 2009-10, the year she encountered Naveda. Jykera said she had been having a tough time that school year and acted out in Larrick's reading class because she had been confused. She started this school year at Overbrook High, one of 19 district schools on the state's "persistently dangerous" list. But last week, she moved to another district disciplinary school, her mother said. Jykera's mother said she had requested the transfer because her daughter was being bullied via text messages and Facebook. Her mother said it was time for a change for Jykera. She wants the teen to enroll in a cyber charter next year.